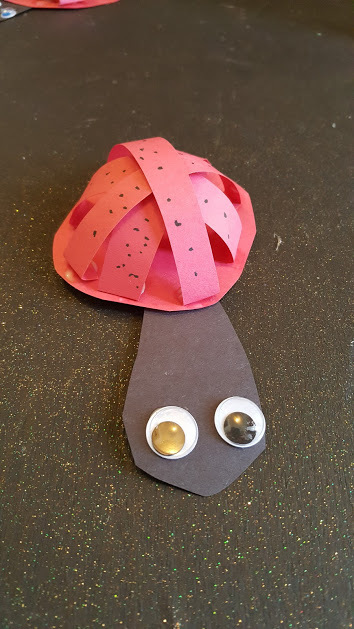 Paper, glue and a few fun craft eyes come together to create a cute ladybug craft your older kids will LOVE to make! Partner, sponsored or affiliate links may be included! I made these with Rolf, who is 8. 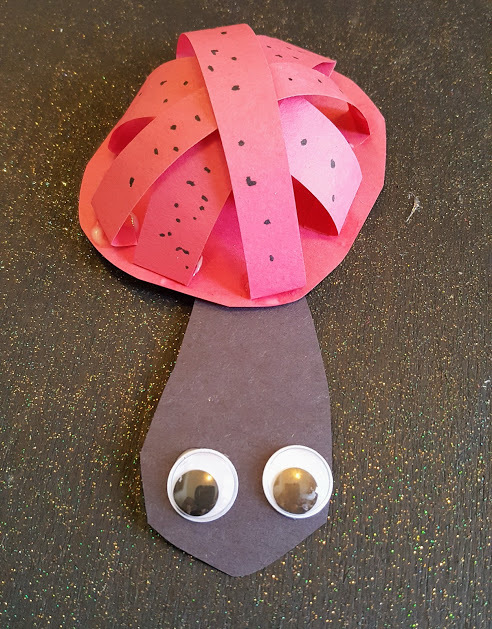 We quickly discovered that a hot glue gun is a necessity for creating these! Otherwise, the supplies are quite common, making these perfect for a quick afternoon craft, or a way to make something worth bugging out over on a day that is maybe rainy, or too hot to get out and play! Cut a circle in the size of your choice from the red paper. With the leftover paper, cut 4 strips that are about 1" longer than the circle you just made. This will be your body. Fold all of the ends of red strips over, then begin gluing them on the red circle. Glue the "tabs" you just created by folding ends. As you can see, I started with one strip going across the circle, then I continued until the strips had formed a shell. Cut an oval-ish shape from the black paper, glue this under the shell you just made to form the head. Add 2 craft eyes to the head. With a marker, carefully add black dots. Allow to dry, and you have a fun 3D Ladybug! You might also love this other fun 3D Ladybug that we made a while ago! If you are looking for even more buggy fun, we made ladybug valentine cards . Don't forget about our B is for Butterfly craft and coloring page too!